The LAMY accent series has defined the character of the Lamy brand for many years. Sensual design meets modern understatement and stylish refinement meets formal lucidity without material profusion. The sophisticated details and functional elements particularly determine the look of the series, which was created by Phoenix Design in 1998: a cylindrical design language, externally sprung solid clip and interchangeable grip sections. This was a premiere at the time with which Lamy paved the way for individual freedom of design in the premium writing segment. In 2014, the company is putting the focus back on the characteristic individuality of the series: the new galvanic surface in an aluminium look gives the writing instruments a fine, silver colour with velvety appeal: purist, modern and sensual.Entirely new aesthetics are created in combination with the two grip sections, which are tuned to your personal style: the seasoned black rubber grip section radiates a classic elegance with the writing instrument's harmonious aluminium look - perfect for official occasions and events. In addition, the new 'Karelia wood' grip section made of multi-layer, dyed wood with a silky-matt clear varnish gives a sensual, authentic dimension to the writing experience. 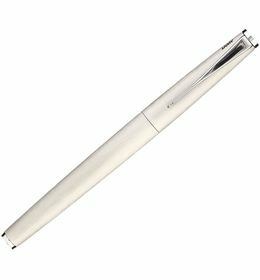 Naturalness and style merge into one; the writing instrument becomes a statement and adapts to your personal lifestyle. The subtle 'achat grey' colour harmonies perfectly and provides a refined finish. 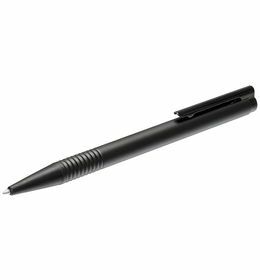 The LAMY accent Al is available as a fountain pen, ballpoint pen, rollerball pen, mechanical pencil and the multifunctional writing instrument 4-pen with the 'Karelia wood' and black rubber grip section. • Returns: No returns/exchange or refund. • Warranty as per our standard warranty conditions. 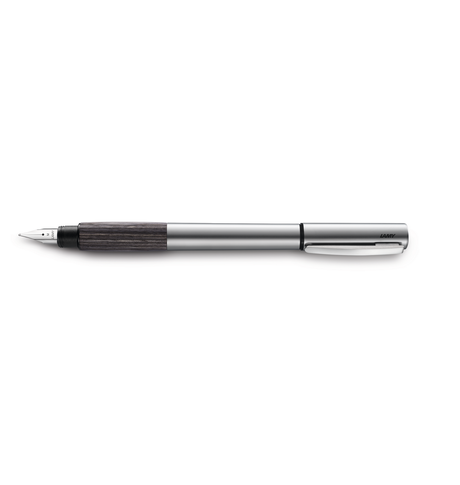 The LAMY accent series has defined the character of the Lamy brand for many years. Sensual design meets modern understatement and stylish refinement meets formal lucidity without material profusion. The sophisticated details and functional elements particularly determine the look of the series, which was created by Phoenix Design in 1998: a cylindrical design language, externally sprung solid clip and interchangeable grip sections. This was a premiere at the time with which Lamy paved the way for individual freedom of design in the premium writing segment. In 2014, the company is putting the focus back on the characteristic individuality of the series: the new galvanic surface in an aluminium look gives the writing instruments a fine, silver colour with velvety appeal: purist, modern and sensual.Entirely new aesthetics are created in combination with the two grip sections, which are tuned to your personal style: the seasoned black rubber grip section radiates a classic elegance with the writing instrument's harmonious aluminium look - perfect for official occasions and events. In addition, the new 'Karelia wood' grip section made of multi-layer, dyed wood with a silky-matt clear varnish gives a sensual, authentic dimension to the writing experience. 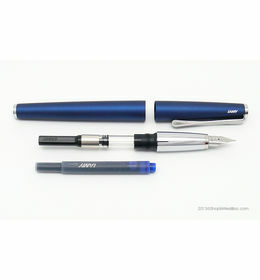 Naturalness and style merge into one; the writing instrument becomes a statement and adapts to your personal lifestyle. The subtle 'achat grey' colour harmonies perfectly and provides a refined finish. 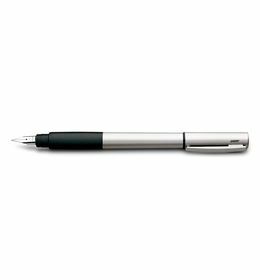 The LAMY accent Al is available as a fountain pen, ballpoint pen, rollerball pen, mechanical pencil and the multifunctional writing instrument 4-pen with the 'Karelia wood' and black rubber grip section. Cancellation and Return Policy: • Cancellation: Upto 24 hours of departure is fine • Returns: No returns/exchange or refund. • Warranty as per our standard warranty conditions.